Making Moves. Inkjet Expands its Presence with Cutsheet Offerings for Production Environments. Production inkjet diversifies with cutsheet systems that offer continuous improvements in color and media compatibility to broaden its appeal. First targeted at direct mail environments, these solutions generate attention from the commercial space with the latest advancements. Despite the benefits to inkjet, high acquisition costs as well as quality and media restrictions challenge the adoption of continuous feed inkjet. Cutsheet devices offer a lower cost of acquisition, smaller footprint, and quality that make them suitable for new markets. According to research firm, InfoTrends, these devices fall in the “zone of disruption,” and target the production gap between cutsheet toner and continuous-feed inkjet, which is a monthly volume between one and ten million. Cutsheet inkjet devices feature a smaller sheet size, typically B3 and B4 sheets, allowing two and four up, respectively. Here we discuss the benefits, limitations, and opportunity for cutsheet inkjet as it expands its role in digital production print. The combination of the reduced costs of inkjet and the media and application flexibility of sheet-fed production allow print providers to produce record-high volumes while experiencing high uptimes, says Erik van Deurzen, senior director of product marketing, Canon Solutions America. “They can do this with increased quality that rivals the look and feel of toner, but at price points that rival offset printing. With recent advances in technology, sheet-fed inkjet is truly the optimal crossover point of quality and affordability,” he adds. John Santoli, global product manager, Xerox Brenva HD Production Inkjet Press and Chris Irick, worldwide product marketing manager, entry production inkjet, Xerox, comment that historically, the largest print shops have had the high volumes, deep pockets, and available floor space required to justify seven-figure inkjet acquisitions, but times are changing. Santoli and Irick point out that the value proposition of a cutsheet inkjet press is a lower total cost of ownership. “Printers no longer need to invest $1 million plus in an inkjet press to achieve a lower run cost. Cutsheet systems are less expensive to acquire, making the benefit of lower inkjet run costs accessible to more printers,” they add. Additionally, the cost and footprint offer the potential for redundancy, giving customers the flexibility to manage print volume peaks and maintain critical production should a press be down for maintenance or repair. Early adopters of cutsheet inkjet were primarily in the direct mail space, however, the latest advancements are attractive to commercial and book printers. Overall, applications regularly produced with cutsheet inkjet include direct mail, brochures, pocket folders, marketing collateral, posters, books, transactional, point of purchase, folding cartons, educational materials, and cards. “Early adopters shifted their business models to compete based on value, instead of price per piece. They’ve shifted applications from mass production to mass customization at a lower price point while still maintaining toner-like quality,” says van Deurzen. He says other early adopters come from companies that recognize that inkjet is the wave of the future, but cannot invest in larger continuous feed inkjet since sheet-fed devices tend to have a lower acquisition price that enables smaller and mid-sized printers to take advantage of inkjet technology. Grant Robinson, business development manager, Delphax, says early adopters for Delphax include companies with a number of low-volume electrophotographic devices, which have been replaced with a single inkjet device for a higher level of productivity, faster turnaround times, and more cost-effective production. “Typically, these are producing personalized direct mail documents and billing statements,” he offers. As the technology continues to develop, the possibilities have just begun. 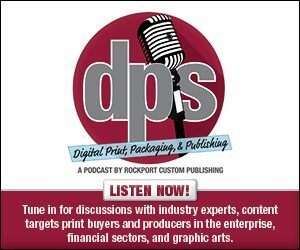 Advancements in cutsheet inkjet come in the form of productivity as printers learn the technology and adapt their businesses and applications for optimal results and from technology as manufacturers continue to improve upon current solutions, predicts van Deurzen. Robertz says the industry can expect the introduction of 40-inch cutsheet inkjet devices that continue to expand the range and capabilities of digital, commercial, and package printers. For example, Komori debuted its Impremia NS40 nanographic printing system, producing 6,500 full-size, four-color, 40-inch sheets per hour (sph). Robinson believes we can expect to see the gap between cutsheet and roll fed productivity decrease, allowing print providers to leverage the flexibility of cutsheet at a much more attractive return on investment. “We also foresee continued improvements to image quality on a number of fronts across all inkjet printhead technologies,” he adds. In the short term, expect to see offerings that increase the value of the existing platforms—expanded tested substrate list, additional inline finishing options, and workflow options that make the press more productive. “Although less expensive than a roll-to-roll inkjet press, printers still want to squeeze out as much value from their investment as possible. By offering a full range of options that reduce the printer’s overall touch points is one way to deliver on that promise,” say Santoli and Irick. Media compatibility is the primary challenge facing the cutsheet inkjet market, but working with paper manufacturers and their own development teams, manufacturers are resolving this issue. Xerox continues to work with its paper suppliers to provide specifications and requirements and expand its tested substrate list for Brenva. In parallel, Santoli and Irick say their engineering team is working on expanding the value proposition for the Brenva platform in the future, which includes higher print resolution and support for a full range of offset stocks. Specifically, van Deurzen says Canon Solutions America works with every major paper vendor in the industry to co-develop and rigorously test high-quality papers for its inkjet devices. “We are testing gloss stocks, textured stocks, and heavier weighted stocks for the Océ VarioPrint. Canon Solutions America has three labs dedicated to inkjet that test, qualify, and fine tune technology, media, and ink, ensuring its production printer customers benefit from optimum output quality, productivity, and uptime. Extensive test-print media catalogs demonstrate the quality obtainable from both pigment and dye inks,” he attests. Robinson also says media represents a primary limitation of cutsheet inkjet. “In typical variable data applications, cutsheet media combined with inkjet appears to be a very good fit for the market. The largest issue facing any inkjet vendor—both in and outside of North America—is securing the appropriate medias that are a match for the end customer’s applications and expectations,” he offers. To address this, Komori offers the Impresmia IS20, which is designed to adapt to advancements in inkjet technology. “While the IS29 currently operates at a throughput rate of 300 letter impressions per minute, the press has the capability of handling sheets at many times that rate. Higher throughput translates to lower cost per impression, which in turn lowers the total cost of ownership for our customers and expands the scope of applications that can be profitably produced,” he offers. In a short amount of time, several vendors launched cutsheet inkjet solutions. Many were introduced at the last drupa in 2016. Last year, more than 70 placements of the Océ VarioPrint i300 sheetfed inkjet presses were reported in the market. “Those machines quickly ramped up in productivity, printing over one billion impressions, with one customer even printing 8.5 million impressions in a single month. All of this was done with an average uptime of 97 percent. On the technology side, the beauty of the iQuarris platform, which powers the VarioPrint i300, is that you can expect advancements each and every year as it relates to ink, paper section, and general equipment upgrades,” says van Deurzen. iQuarius Technologies include iQuarius CMYK Inks, Sheet Entry Control, Precision Sheet Control, In-Line Quality Inspection, and the iQuarius Drying System. The Canon Océ VarioPrint i300 targets heavy production volumes of one to ten million pages per month. It handles paper sizes up to 13.9×19.7 inches and produces 600×600 dpi output with drop size modulation to deliver 1,200 dpi perceived image quality. The VarioPrint i300 optional ColorGrip feature enables printing on a wider range of media, expanding the application range. ColorGrip enhances the image quality on papers not designed for inkjet, giving these papers a print quality rivaling inkjet treated stocks. ColorGrip also expands the media range to include some coated offset stocks, enabling print jobs to include a variety of coated, uncoated, and treated stocks. The printer automatically adjusts the print parameters for each media type on a sheet-by-sheet basis. The company also announced the Océ VarioPrint i-Series Release 2, an expansion into a family of ground breaking products that include the introduction of the Océ VarioPrint i200 press, a MICR version for sensitive financial documents and the previously launched Océ VarioPrint i300 device. Powered by Océ iQuarius technologies the expansion is set to provide inkjet productivity combined with sheet-fed versatility while offering cost-effective premium inkjet quality prints on an expansive range of media. At 194 letter-sized ppm, the Canon Océ VarioPrint i200 is designed to bridge the gap between the Canon imagePRESS C10000 device at up to 100 pages per minute (ppm) and the Océ VarioPrint i300 device at 294 ppm and the Océ ColorStream and Océ ProStream series’ with its sheet-fed versatility and consolidation of monochrome and color printing. Delphax presents the elan 500, which offers an average monthly duty cycle of two million letter-sized images and a maximum of five million letter-sized images. The maximum sheet size is 18×26 inches and it features a maximum thickness of 350 gsm simplex, 240 gsm duplex. The maximum print resolution is 1,600×1,600 dpi and it utilizes Memjet Waterfall MEMS-based semi-conductor inkjet printheads. The elan offers print speeds of up to 500 letter images per minute, a small footprint, low power consumption, a streamlined PDF workflow, and a broad range of compatible substrates. The device had a soft launch in 2014 with a full launch at drupa 2016. The Fujifilm J Press 720S runs at 2,700 B2 sph. The maximum print width is 20.24 to 28.86 inches. The thickest stock the press is specified to run is 14 pt. Maximum print resolution is 1,200×1,200 dpi. The J Press 720S utilizes Fujifilm Dimatix Samba inkjet printheads, incorporating Fujifilm’s VersaDrop wavelength jetting technology along with Fujifilm Vividia aqueous pigment inks. Differentiating factors of the device include a high image quality, which is achieved through its advanced printheads and jetting technology. The press provides color consistency and the ability to achieve approximately 80 percent of Pantone colors with a four-color process. Additionally, Fujifilm provides its cloud-based ColorPath Synch color management solution. The J Press 720S has the ability to run both coated and uncoated standard offset stocks due to the use of a rapid coagulation primer, which is applied in real time to each sheet that acts as an ink receptor. It is colorless and has no smell. Konica Minolta’s AccurioJet KM-1 Inkjet Press combines the speed and flexibility of offset presses with the digital benefits of variable data printing and zero make-ready. It prints on 23×29.5-inch sheets, allowing for six-up letter-size printing. The device produces up to 3,000 sph and 1,200×1,200 dpi. According to the company, it features automatic duplex printing from .06 to.45mm sheet thickness; simplex printing from .06 to .6mm sheet thickness; superior stability with absolute consistency in paper-feeding, registration, image quality, and repeatability; and image quality, color gamut, and glossiness that rivals offset presses. The Komori Impremia IS29 is a UV inkjet perfecting printing system that can print six-up signatures at 1,200×1,200 dpi on a range of substrates. The machine’s maximum monthly duty cycle is 10,000,000 four-color letter impressions and an average monthly duty cycle of 2,000,000 four-color letter impressions. It also features a print width of 22.6 inches, a maximum sheet size of 23×29.5 inches, maximum media thickness of single-sided 24 pt. and maximum media thickness, double-sided at 18 pt. It features 1,200×1,200 dpi with multi-level drop sizes. The system prints at full speed at this resolution. It uses a drop-on-demand, piezoelectric UV inkjet with LED curing and a Komori sheet-fed press paper transport and construction. Pricing based on system configuration. The IS29 was launched at drupa in 2016. In addition to its ComColor line of business-focused cutsheet inkjet products, RISO Inc. recently showcased a concept press intended for the high-volume production market. The RISO T2 high-speed cutsheet system offers a significant improvement in efficiency for duplex printing, reaching speeds of 300 duplexed prints per minute. Xerox offers inkjet solutions, including the Xerox Brenva HD Production Inkjet Press, a cutsheet inkjet product. The device offers speeds of up to 182 letter/A4 images per minute and a print width of 14.3×20.5 inches. The Xerox Brenva HD Production Inkjet Press combines the cost effectiveness of inkjet with the flexibility of cutsheet, enabling print providers to capture growth opportunities in key application areas. Cutsheet inkjet solutions enable a more affordable point of entry compared to continuous feed systems for print environments looking to invest in inkjet. As quality and media capabilities continually improve, the potential for placement of these solutions expands. With a few years of experience behind them, many cutsheet inkjet production presses are ready for prime time.